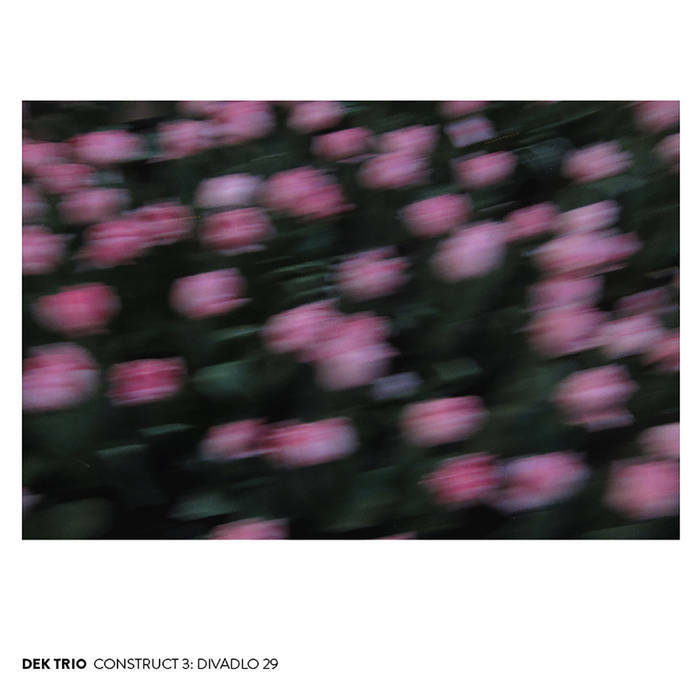 This third and final album in DEK Trio’s Construct-series was recorded in concert at Divadlo 29 in Pardubice, Czech Republic, March 16, 2017. 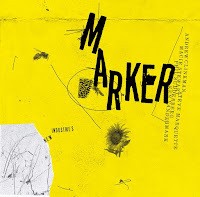 Reedist Ken Vandermark, pianist Elisabeth Harnik and drummer Didi Kern has released two very nice albums so far and this third is no exception. We’re looking, as with Construct 2, at 2 longer improvised performances that both exceeds the 21 minute mark, and a shorter closing act of around 4 minutes. The album starts with ‘Cold Water Shock’ which is about as introvert as you’ll hear this trio. Having heard the two first Construct albums however, I know that I need to pay close attention to what’s happening. Scenes change quickly with DEK Trio. Harnik seems to be determined to stay in a calm landscape without pushing Vandermark or Kern in any direction. After two thirds of the song Vandermark manages to lure her out with a repetitive string of notes and sure enough she’s traveling alongside him for a while. Kern has a distinctive style on this first song compared to how I’ve heard him in the first two Construct albums, and provides stability and steady percussive beats. Vandermark becomes more lyrical towards the end of the song, which must be seen as ‘his’ show almost entirely even though Harnik ends the song with furious runs over the piano. 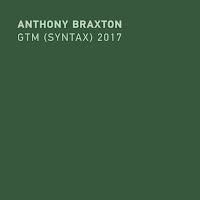 The second song, ‘Accident Technique’ also carries a more calm and soothing character. 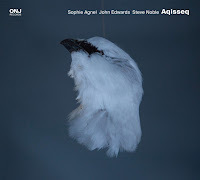 The trio explores different sounds; clicks, pops, rings, dings, dongs, gongs and everything in between, to build up tension over the first minutes. 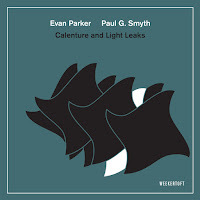 Vandermark guides his notes through this landscape in an elegant way and I’m wondering whether there’s going to be a release of energy soon. Passing the six minute mark we’re taken even deeper into the minds of the DEK Trio. Kern creates an uncertain mood by presenting a nervous and vibrating beat. It doesn’t last very long and I find myself waiting for the next move. Vandermark leads the way trying different melody patterns taking them in different directions. Kern and Harnik joins in and we’re off the last journey of free explorations. The contrast between what in this song must be said is a lyrical Vandermark, and the strong and independant Harnik is exquisite to hear. And then, suddenly they meet. I quickly realize that I had began to relax, and I’m almost surprised by the burst of energy. This is how I like DEK Trio best; in the fast paced, manic runs in and out of the music. Here’s also where Kern and Harnik takes up space and shine. 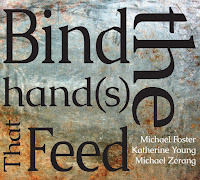 Kern comes back to steady beats from time to time, he’s doing this across all three Construct albums. He’s giving (himself too?) us an island to rest on, an interesting balance between the free and the structured. It’s very elegant as it also provides a strong dissonance with Harnik and Kern. The song ends with DEK Trio returning to pulsating sounds, bells and tingelings. The very last song of the Construct series, ‘Falling Trees’ is only four minutes but surprisingly full of interesting details. Clicks, pops, screeches, scratching. Vandermark is calling out, asking, almost pleading. And then...the last word is said. it’s over. 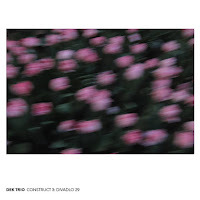 DEK Trio has released 3 really nice albums, and I would like to recommend that you pick up all of them. They’re all different in character, but as a triple album it becomes a profound and deep experience and an insight into the great mind of Ken Vandermark and the DEK Trio. I’ve gotten to know Elisabeth Harnik and Didi Kern as well, and I must say this trio is going to be fantastic to follow moving forward. I like Construct 1 and 2 a little bit better than Construct 3 - but as whole, this is a fantastic set of albums.